Favourite Albums Of All Time!…The Chills – Soft Bomb | Shut Up Hamish! Finally got a copy of Soft Bomb by seminal Dunedin band The Chills, an album I love dearly but for some reason never owned a hard version of until now. I’d passed up on buying a vinyl copy from Tony at Tootone Records in North East Valley a few years ago, something I regret, especially as because on the day I was strongly considering purchasing it Martin Phillipps walked in, trading in some of his massive vinyl collection to Tony. Would have been the perfect opportunity to get the vinyl signed. Never the less, I didn’t want to appear the over zealous fan. If i was in that situation a second time around, I would most definitely not care at all about showing my appreciation to the man who created the music. 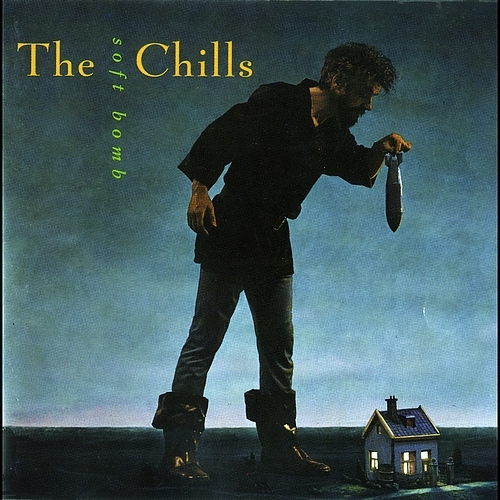 Soft Bomb is The Chills’ follow up to probably their most highly regarded studio album, 1990’s Submarine Bells. Submarine Bells is a classic of Indie Pop, featuring thoughtful and elloquent lyrics, catchy and inventive melodies and classic tracks such as the aptly titled, Heavenly Pop Hit. It’s a strong album, but not my favourite Chills album; that honour would go to it’s follow up, the slightly more sprawling Soft Bomb. Either that or Kaleidascope World, you can’t really go past the early singles for evidence of the magic of the peak of the ‘Dunedin Sound’, if I am permitted to use that controversial label. Soft Bomb was the big album that would break The Chills internationally. The Chills were now signed to States label, Slash Records, a subsidiary of Warner and the extra cash of a major label can be heard in the albums slicker production values, compared to earlier Chills albums and to other Flying Nun acts. Many Flying Nun purists possibly don’t feel the big studio production benefits the sound of The Chills and Martin Phillipps has told me he himself prefered the demo versions of these tracks to the final versions. I on the other hand love the huge drum sound and crisp, energetic guitars. It’s certainly removed from the raw, reverb-smothered vibe of Pink Frost, but Martin Phillipps also wrote great mainstream pop as well as atmospheric, rough post-punk. This is his great, slick pop album. An inspired lyrical theme, with brilliant melodies to accompany it. I wonder if the corporate vulture line was inspired at all by his experiences being a cog in the big business machine in the States. Sadly I can’t link the song to you as it isn’t on YouTube, or Spotify. I will upload the song or provide a link when I can. It’s a shame that a song as good as this is as difficult to find as it is. The album also contains several entertaining interludes, Soft Bomb I, II and III and there is no harm in trying and there is no point in trying. These interludes give the album some kind of arch and tie the seperate stories and styles together. A sprawling album in the vein of The White Album or Sandinista! yet held together in a much tighter and more thoughtful way than both those albums. To me, the album is in the same league as those classics. A high point of the The Chills career and of New Zealand music in general, it’s a real shame that Flying Nun have not done more to get these classics back out there in record stores. The album has not been re-released, is out of production and quite possibly caught up in some copywrite hell due to The Chills being dropped from US label Slash records soon after the release of Soft Bomb. It was by chance I found the second hand CD sitting in the NZ section of Real Groovy in Auckland. If you do find a copy of this album, and it will most likely be on Trademe or Ebay, I assure you that you won’t regret the purchase. Martin Phillipps and the pop gift and for a time he was on top of the world. This album is the soundtrack to that time. Of course what goes up must come down, and although Martin Phillips and The Chills career after Soft Bomb continued, he would not have that level of international influence behind him to realise his visions again. Perhaps he prefers it that way, he can have total control, and doesn’t have to be a part of the corperate music world. He still plays excellent gigs occasionally around New Zealand, including a packed one just recently at the Botanical Gardens in Dunedin. I guess all that is another story however, for another blog. Here’s an interview with Phillipps from 1992, which gives insight into the break up of The Chills as well as the many stresses and difficulties throughout their career. It is a refreshingly frank piece of journalism and includes interviews with previous Chills, who give some of the reasons for why Martin struggled to keep line-ups together. It’s a shame the drama following The Chills often overshadowed the brilliant music. Martin and The Chills are well and truely back at it, having just completed their first UK tour since 1996 and have a new album, Silver Bullets coming out later this year. The recent live performances look brilliant, judging by audience recordings such as this Rolling Moon performance from London. Molten Gold, the latest single with a re-recording of Pink Frost as it’s b-side is out on Fire Records. Indeed exciting times for this seminal Dunedin band. Lovely post – thanks for remembering a great album from a great band. Just purchased a copy on Trade Me for $6.00 and postage, enjoyed your post and looking forward to hearing the cd again.